The all-time biggest grosser of Hindi cinema, 'Dangal', did not win any IIFA this year. Why? Here is the real reason. The IIFA committee has issued an official statement regarding Aamir Khan starrer 'Dangal' that the film makers did not send the entry forms back to them. After some people on social media started criticizing the IIFA 2017 of being biased and not giving any award to the sports drama 'Dangal', the organizing committee has now justified everything. The official statement released by them reads- "So basically, in IIFA, forms are sent to various production houses. They fill those forms up and send it back to us. Those forms are then put out to the industry for voting and from there it becomes a nomination." "So, Dangal has not sent their entry in. We would love Dangal to be a part of it. I think it’'s a movie that’s broken all records. We love Aamir Khan and the two little girls. They did a great job. But unfortunately, they didn’t send their entry in. We feel sad", said the Director of Wizcraft International- Andre Timmins. 'Dangal' recently performed exceptionally well at the Chinese box-office after breaking several records in its home release. Aamir Khan, Fatima Sana Sheikh and Sanya Malhotra starrer wrestling film is based on the real life story of Mahavir Singh Phogat played by Aamir Khan who teaches his daughters to wrestle. 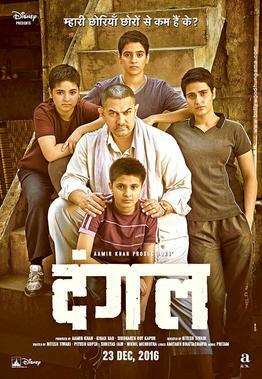 'Dangal' has been directed by Nitesh Tiwari. It is to be noted here that Aamir Khan avoids award functions and never attends any. IIFA 2017 this year was held in New York and 'Udta Punjab' bagged the Best Film Award. Sure, had 'Dangal' makers sent back the entry forms of IIFA 2017, the film would have swept all the major awards, including the Best Actor Male which Shahid Kapoor won for his amazing performance in 'Udta Punjab'.